Zereshk (زرشک) or sereshk is the Persian name for the dried fruit of Berberis spp., specially that of Berberis integerrima 'Bidaneh', which is widely cultivated in Iran. Iran is the largest producer of zereshk and saffron in the world. Zereshk and saffron are produced on the same land and the harvest is at the same time. It has been widely cultivated for hedges in New Zealand. Berberis vulgaris (European barberry) is the alternate host species of the wheat rust fungus (Puccinia graminis), a grass-infecting rust fungus that is a serious fungal disease of wheat and related grains. For this reason, cultivation of B. vulgaris is prohibited in Canada and some areas of the United States (Connecticut, Massachusetts, Michigan, New Hampshire). 1 2 "Berberis vulgaris". Natural Resources Conservation Service PLANTS Database. USDA. Retrieved 24 March 2016. ↑ Alemardan, Ali; Asadi, Wahab; Rezaei, Mehdi; Tabrizi, Leila; Mohammadi, Siavash (2013). "Cultivation of Iranian seedless barberry (Berberis integerrima 'Bidaneh'): A medicinal shrub". Industrial Crops and Products. 50: 276–87. doi:10.1016/j.indcrop.2013.07.061. ↑ Tehranifar, A. (2003). "Barberry Growing in Iran". In Lee, J-M.; Zhang, D. XXVI International Horticultural Congress: Asian Plants with Unique Horticultural Potential: Genetic Resources, Cultural Practices, and Utilization. ISHS Acta Horticulturae 620. pp. 193–5. ISBN 978-90-66054-00-4. 1 2 Vogl, Sylvia; Picker, Paolo; Mihaly-Bison, Judit; Fakhrudin, Nanang; Atanasov, Atanas G.; Heiss, Elke H.; Wawrosch, Christoph; Reznicek, Gottfried; Dirsch, Verena M.; Saukel, Johannes; Kopp, Brigitte (2013). "Ethnopharmacological in vitro studies on Austria's folk medicine—An unexplored lore in vitro anti-inflammatory activities of 71 Austrian traditional herbal drugs". Journal of Ethnopharmacology. 149 (3): 750–71. doi:10.1016/j.jep.2013.06.007. PMC 3791396 . PMID 23770053. 1 2 3 Steven D. Ehrlich, NMD (22 June 2016). "Barberry". University of Maryland Medical Center (UMMC). VeriMed Healthcare Network. Retrieved 29 February 2016. 1 2 3 "Barberry". Drugs.com. Wolters Kluwer Health. 2009. Retrieved 29 February 2016. 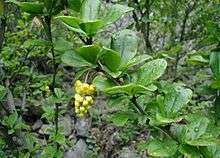 ↑ "Berberis vulgaris". The Plant Encyclopedia. 29 May 2011. Retrieved 29 February 2016. ↑ Popay, Ian; Champion, Paul; James, Trevor, eds. (2010). "Berberis glaucocarpa barberry". An Illustrated Guide to Common Weeds of New Zealand (3rd ed.). Christchurch: New Zealand Plant Protection Society. ISBN 978-0-473-16285-6. ↑ "Archived copy". Archived from the original on 2015-04-02. Retrieved 2015-03-07. ↑ Turner, NJ; Hebda, RJ (1990). "Contemporary use of bark for medicine by two Salishan native elders of southeast Vancouver Island, Canada". Journal of Ethnopharmacology. 29 (1): 59–72. doi:10.1016/0378-8741(90)90098-e. PMID 2345461. ↑ Foster, S; Tyler, VE (1999). Tyler's Honest Herbal (4th ed.). Binghamton, NY: Haworth Press. ↑ Schauenberg, P; Paris, F (1977). Guide to Medicinal Plants. New Canaan, CT: Keats Publishing, Inc.
↑ Duke, JA (1985). Handbook of Medicinal Herbs. Boca Raton, FL: CRC Press. ↑ Hartwell, JL (1971). "Plants used against cancer. A survey.". Lloydia. 34 (4): 386–425. PMID 5173435. ↑ Gieler, U.; Weth, A von der; Heger, M. (1995). "Psoriasis vulgaris - gute Erfolge mit Homoeopathika". Ars Med. 14: 1018–1019. ↑ Gieler, U.; Weth, A von der; Heger, M. (1995). "Mahonia aquifolium -a new type of topical treatment for psoriasis". Journal of Dermatology Treatment. 6 (1): 31–34. doi:10.3109/09546639509080587. Wikimedia Commons has media related to Berberis vulgaris.